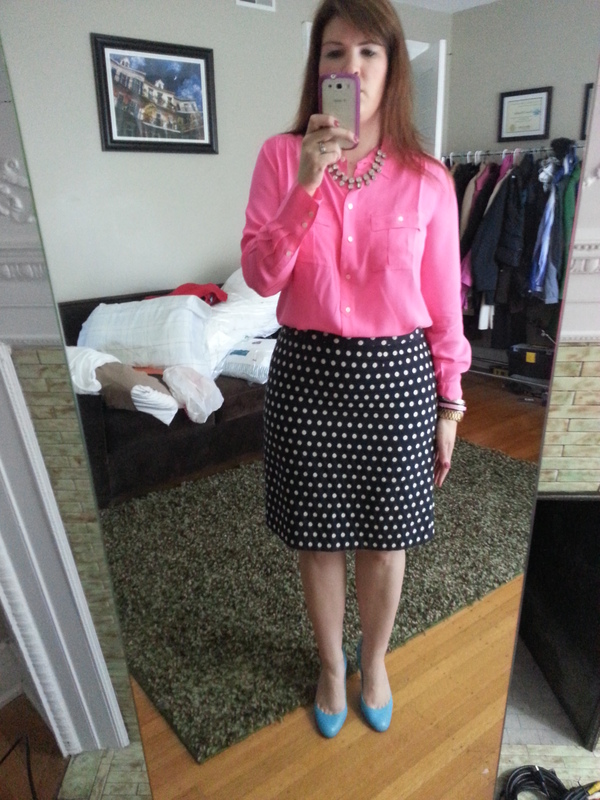 I bought this J.Crew Blythe Blouse in Shocking Pink a few sales ago and finally decided to wear it this week. This is day one of my no-stripes week. I actually spent some time to plan my wardrobe out this week which I’m going to try and continue so I’m not such a disorganized un-fab mess in the morning trying to get ready. This blouse is bright and I don’t think I realized how much until I was at work under our oh-so-flattering flourescent lights. But now that I’ve worn it, I love it and am already trying to plan new outfits for it. I’m a little sad because in a flurry of deleting the no-go outfit photos from my phone, I accidentally deleted the one ‘perfect’ pic for posting. I find that for every ten photos, I get one good one. All the more reason to plan my outfits in advance so I have time to take extra photos in the morning. When a co-worker stopped by my desk today and asked to borrow a highlighter, it occurred to me that this blouse is the exact shade of a pink highlighter. Which I’m totally ok with. I used to always prefer the pink highlighters over the yellow ones growing up. I still use them when I can. Neon yellow may come and go but I have and will always love hot pink. How about you? Do you have a color that has come and gone out of style but you will still wear regardless? Would love to hear what you think and thanks for visiting!